The operation of the board is very simple. After powering the board from a 3-5.5V supply, the Enable (EN) pin must be pulled high to activate the IR sensor. Next, place the tip of your forefinger gently over the sensor on its face. Your finger should be still and should not press too hard on the sensor. Within a couple seconds the circuit stabilizes and you will see the LED flashing synchronously with your heart beat. 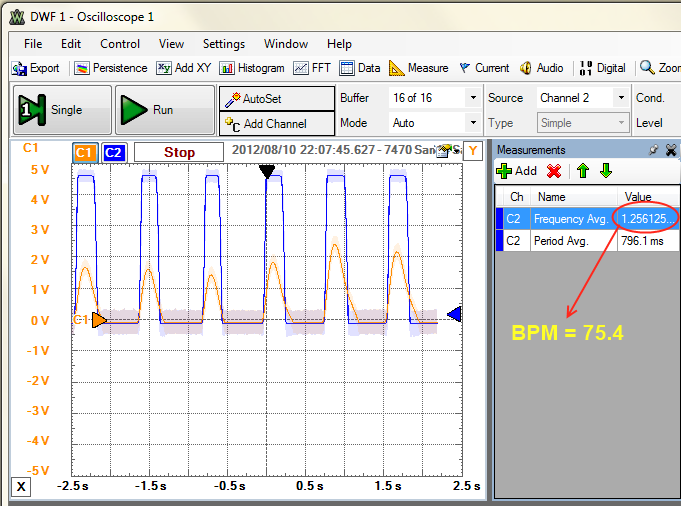 You can feed the output signal (Vout) to either a digital I/O or an ADC input pin of the microcontroller for measurement of the heart beat rate in BPM. 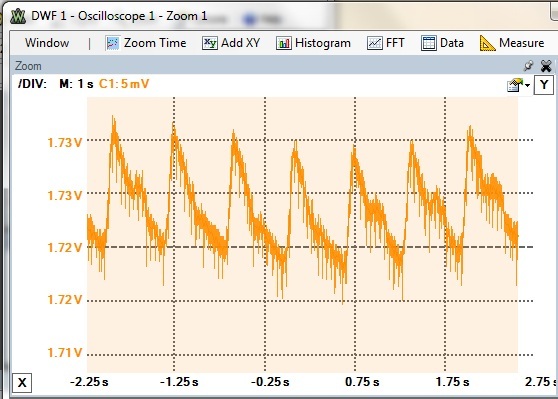 The output voltage waveform can also be viewed on an oscilloscope. 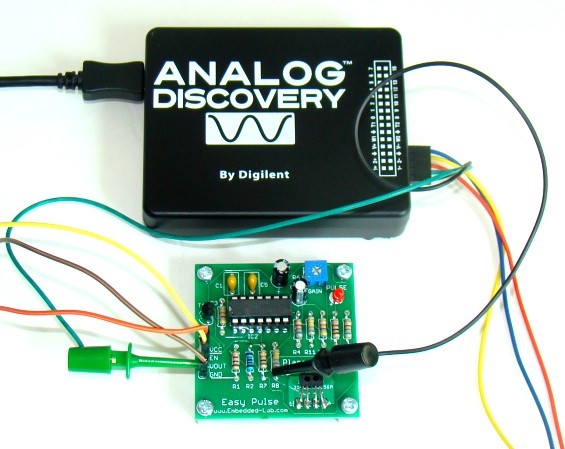 I connected Digilent’s Analog Discovery tool to check the input PPG and the output waveforms from the two LPF stages. The following pictures show these signal waveforms as displayed on the PC screen when . 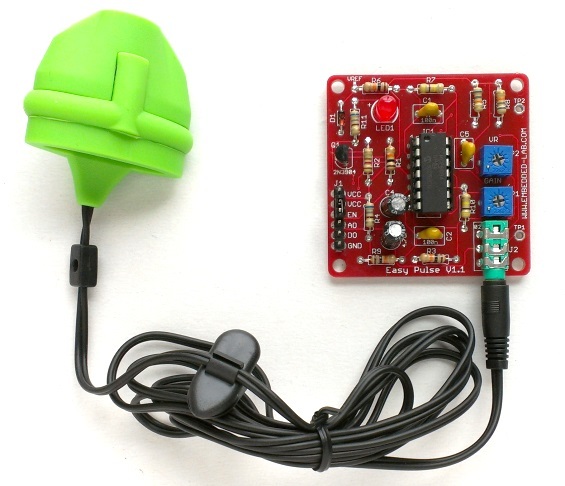 The Easy Pulse output signal can be connected to a digital input pin of Arduino or ChipKIT board to find its frequency. If you multiply the frequency by 60, you will get the heart rate in BPM. I have written a demo code for chipKIT Uno32 and IO Shield to display the heart rate on the OLED. The VCC, EN, VOUT, Gnd pins on the Easy Pulse board are connected to 3.3V, 5.0V, Pin 2, and Gnd pins of the I/O shield, respectively. I have made 20 PCBs of Easy Pulse board using iTeadStudio’s 5cm x 5 cm double layer PCB service and I am giving out 15 of them in the form of kits including all the parts required to assemble the board. For those who are interested to try Easy Pulse, the price per kit is $18.00 including the shipping cost within the United States. I will accept payment through Paypal only. You have to email me first at admin (at) embedded-lab (dot) com and I will then send you my Paypal ID. Once I get the payment, I will mail your package through regular USPS (usually takes 3-5 business days). This kit can also be purchased from Tindie. The following picture shows all the parts that are included in the kit. If you want the sensor to be separate from the board as described earlier, you will need a wire to connect it to the board. The picture below shows a proper way of connecting the sensor to the board using a 4-pin jumper wire. Since the pins or legs of the TCRT1000 are thinner than the holes in the jumper wire, you may need to thicken them a little bit through soldering so that it is hold tight. 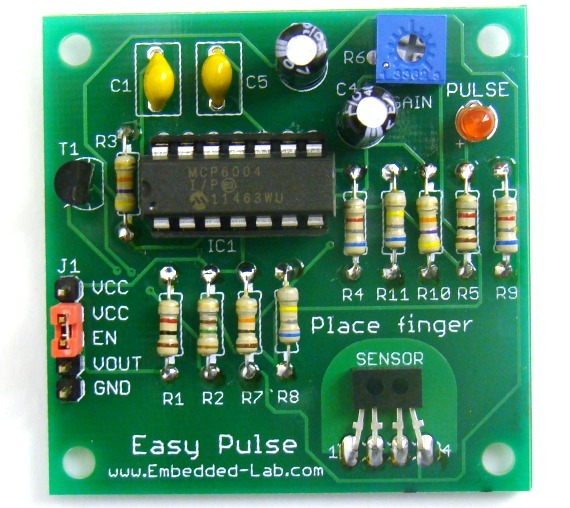 Easy Pulse provides a reflective IR sensor with necessary instrumentation circuit to illustrate the principle of photoplethysmography as a noninvasive technique for measuring heart rate. In order for this sensor to work, the fingertip should be placed gently over the sensor and be kept still. The sensor may also be wired to the board through a 4-pin jumper and header pins. 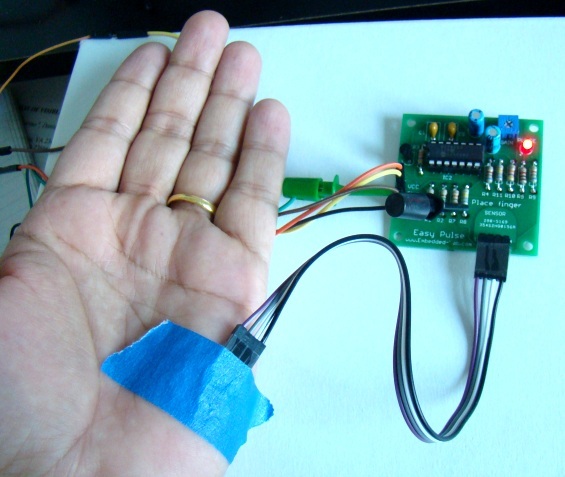 This gives more flexibility of using the sensor as you can place the sensor over the skin on palm, or wrap around a fingertip using paper or duct tape. A more practical way of putting a sensor would be in the form of a finger clip, like in commercial Pulse Oximeters, so that the sensor performance would not be affected too much by a slight movement of the finger. 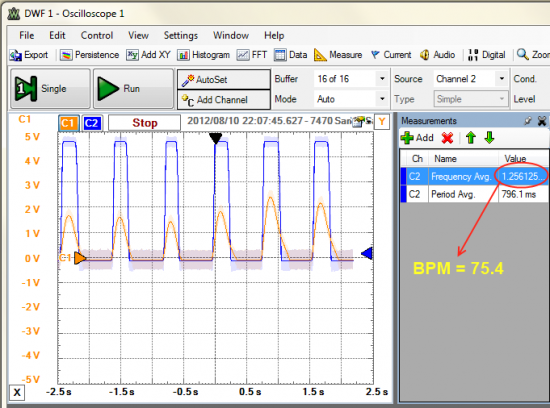 Easy Pulse Version 1.1 has been released with improved performance and features. Click here for more info. 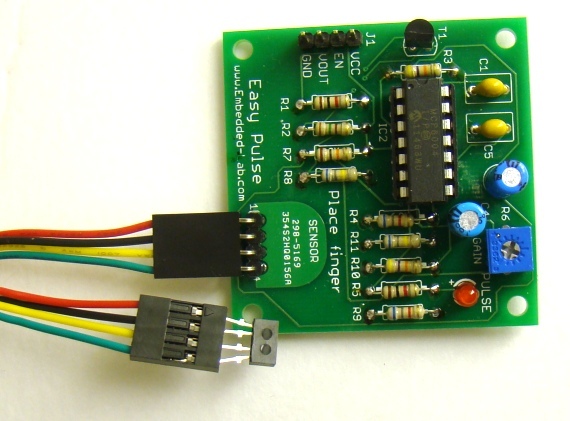 Easy Pulse version 1.1 boards are now also sold by Elecrow, a China-based company, for $18.50 and ships world-wide. 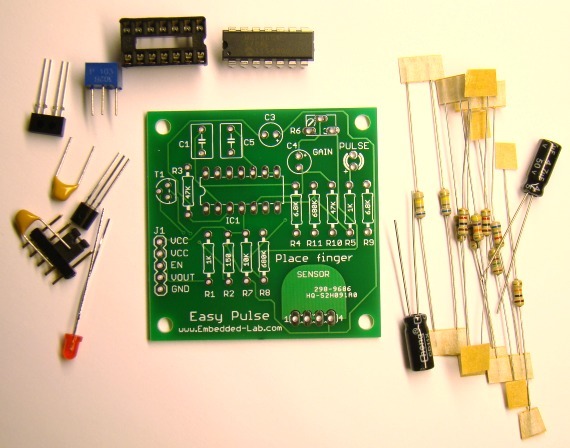 Please visit the following link if you are interested on getting an assembled Easy Pulse V1.1 board. Do you have the C code for this? I want to use a 8051uC. can i use the code for IC-PIC16F628 ? sir could you please tell me whether the previous version microcontroller(PIC16F628A) can be work with this version with the same progeram…???? Can it measure blood volume or only pulse? And – does it have to be from 2 directions – like 2 sides of the finger, or can you just put it on the body? It can only measure pulse. >> (How) Can I measure/display the oxygen saturation with this tool ? could you please send me the values of resistor and capacitor……??????? i want to buy easy-pulse-a-diy-photoplethysmographic-sensor …..
but when i m clicking BUY EASY PULSE ONLINE then they show me the error page.. so what i do? Check it out now. The broken link has been fixed. May I ask if there is a version of this module with bluetooth ? Sorry, I don’t have an example for that. I finally managed to interface this sensor with CC2541. However, there is a small peak between each diastolic peak and each systolic peak. Would that be a result from noise? And if so, how would you suggest I get rid of it? 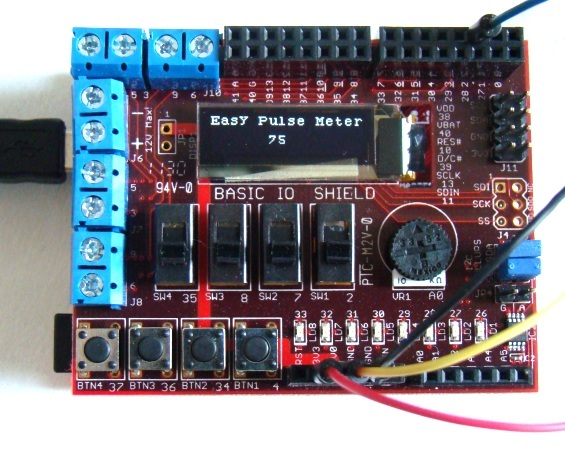 Hi, may I know is it possible to purchase the Easy Pulse kit? I would like to ask for your permission to use your schematic in a project I am working on to measure blood pressure. That’s fine. You can cite the source when you do that. Can we use the same sensor for glucose measurement? for measure glucose I have read several journals mention the IR LED should have a wavelength of 1450 or more. hi,nice project but can we use this in real time or only for learing purpose? By seeing this project views,we plan to make this project as our final year BE project. So we want a conformation from your side about the circuitry. so please help us. hello my self abdul i am doing project to measure blood pressure via wrist with tcrt 1000 sensor so please can you guide in programming of code . Does this circuit work with other microcontrollers other than Arduino? I’m using mbed LPC1768. Sir, can this circuit be implemented first on Breadboard 4 verification .? Do you have any Easy Pulse kit on sale? so may you send me a kit to Taiwan? I pay all shopping cost. can i get layout of this design. is it possible to measure Glucose concentration in the blood continuously using this same phenomenon, i mean with the same kind of sensor…? The frequency of the pulse is 0.7 hz to 2 hz ….right??? bandpass filter can also work ??? Can i get details mailed? can i use any other opp instead of MCP6004?? You can try LM324 or two LM358. can I use MCP6024 for the revised version too? MCP6004 in not really available in the market here. If not would u jst suggest me an alternative. Buy it from element14.in or kits n’ spares website! sir ,could you please send this project of programing code . I can need this programing code interfacing with microcontroller. sir ,could you please send this project of programing code . I can need this programing code interfacin with microcontroller. Hello, can the sensor measure the puls at the wrist? Hi.what is the differences between two projects this project and http://embedded-lab.com/blog/?p=1671 ? I want to display the graph using arduino on tft display but is it possible ?and the project giving with website different filter level. I can get useful ppg graph ? I’m using 2 LF353N op-amps instead of the MCP6004, and I’m using a 1 uF cap with 220k resistor to create the .7 Hz cutoff. I’ve connected everything correctly multiple times, but I still get nonsensical data resulting from Vout. What would you suggest would be the problem? Hello, I am planning to build this circuit by buying all the separate materials and I just want to be able to see the LED flash. What is the use of the 2-pin enable jumper and could you also send me the wire connections? The 2-pin enable jumper connects the Enable pin to VCC in the circuit. O meu sensor TCRT 1000 não está gerando o sinal nessa faixa de frequencia. Ele só pisca o LED quando mexemos o dedo, mas essa não é a ideia do trabalho. Como posso conseguir o sinal apenas colocando o dedo sobre o sensor. Fiz o circuito da maneira como está no KIt, troquei o sensor, mas nao deu certo. Obrigado! Guys can i know if i can buy the sensor online an for hw much ??? can u please inform me what is the biasing voltage vcc for the sensor tcrt1000….also what is the enable voltage? To: rgv You need 3 tries? 🙂 It did not work with these elements? Can you describe what changed? It will be useful to everyone, the device does not work. To: rgv. Potrzebne ci były 3 próby ? 🙂 Nie działało z tymi elementami ? Może opiszesz co zmieniłeś ? Przyda się wszystkim, którym urządzenie nie działa. great work dude (y) !!! i m a biomedical engg, so got a lot amount of interest in this topic for obvious reasons. and after two to three trails got the heart beating electroniically 😀 🙂 (y) !!! mark of a true engineer ! u have owned my respect dude! hey mate, hope everything is ok!! listen i have some queries with that project and i was wondering if you could help me. I used t h e i d e n t i c a l elements as in the diagram. The device does not work. Do not be fooled. I lost two days of the trial. I was just wondering where the code for interfacing the board with the arduino is? nir sensor is also used for measuring glucose .can the same circuit be used to measure it as only the final calibration is different? The sensor I used was the TCRT5000, the op-amp used was two LM741, and to activate the sensor used a 330R resistor instead of the transistor. Boa tarde Raniere, Você pode me ajudar fornecendo informações de como conseguiu fazer funcionar?? Estou utilizando o TCRT5000 também com resistor de 560 para ativar o sensor. Estou usando dois ampops LM358, mas não estou obtendo sucesso. Tem como passar o seu circuito por favor?? can anyone plz tel y gain of 101 is necessary @ amplification stage?? Do you have any easy put kit on sale? so may you send me a kit to Brazil? I pay all impost. can anyone tel me, how amplification and filtering coverts signal to TTL pulses?? wats that enable pin does…. ?? 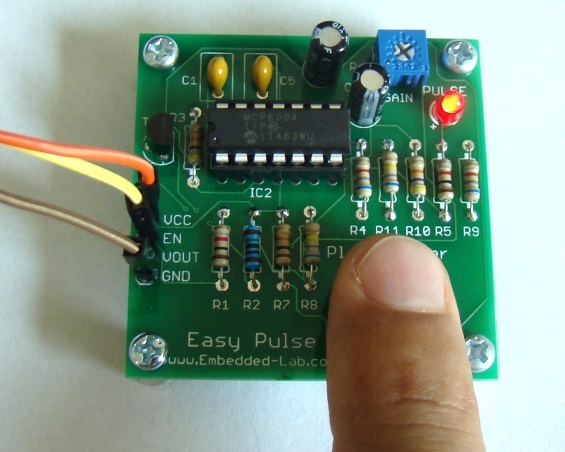 Could the Easy Pulse be modified to provide an arterial pressure measurement? Can anyone tell me why filtering is done twice. Once high pass and low pass is used, the other frequencies less than .7 hz and greater than 2.34hz should have been removed? 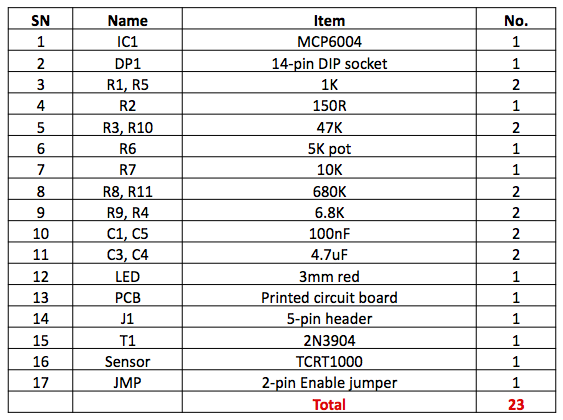 Can I use LM324 instead of MCP6004?? Just ordered one of these for a Raspberry Pi project! I need the complete circuit diagram of this project. Please help. i have tried to make at home but signal is very noisy on CRO. how can i can remove noise from the output signal? PLEASE SEND SOME SUGGETIONS FOR FILTERING THE ANALOG SIGNAL? I tried it with mcp602,it isn’t working.The o/p from my tcrt1000 sensor is not like d one shown above.Any guesses what the problem might be? you said pulling the Enable pin high will turn the IR emitter LED on and activate the sensor. If without microcontroller and “Enable” directly connect to 5V is’t still can on activate the sensor? can I use MCP602 for the revised version too? MCP6004 in not really available in the market here. If not would u jst suggest me an alternative. Yes, you can use MCP602. Very nice project. I would like to ask you firstly how did you figure out the cut-off frequency needed for the HPF and the LPF, and also about the equation Beats per minute (BPM) = 60*f how did you derive this equation. I made the complete circuit on a breadboard. To check he o/p i used an CRO. The CRO shows a signal of arnd 15Khz without any proper shape whenever i put my finger on the sensor, probably just some noise. I have all the parts as per your specs. What can be the reasons for this, I really need this project to work!! hello..nice to meet u all.. im doin a final year project regarding pulse oximeter system. so here i need a circuit based on pulse oximeter system where consist of 2 readings which is heart beat and oxygen saturation. im too confused with this system. can anyone help me to give me a suitable and simple spo2 circuit. im very hoping for your help. tq very much. doesn’t work…. doesn’t work…. doesn’t work…. doesn’t work….!!!!!!!!!!!! MCP6004 and TCRT1000 are not available in market. can i use lm741 at the place of MCP6004 and simple IR tx and IR rx? Can you send me the picture of your assembled board? Make sure you have a jumper placed on between VCC and EN header pins. You said it worked first time. Did you do any changes to it later? What do you mean when you say ‘doesn’t work’? Does the LED not blink at all? Did you buy the kit or make the circuit by yourself? Try adjusting the gain by varying the potentiometer. Put the potentiometer wiper at middle position. I thinking about plug this board as external mic to smartphon and use with some free heartbeat app. I want remove mic from headset cable and then solder there output from hear rate sensor board. Can I do this directly? i have a question please, why is the output TTL pulses? what is the explanation for that? The pulse output satisfies TTL logic levels for 0 (2.4V) with proper gain select.. I would like to build an arduino based autonomous system wich could record for weeks the heartbeat of a mussel on a SD card. However, I’m not an electronician ; do you think “easy pulse” output could be similar to what they obtained in the article mentionned above ? It looks like they implemented the same idea of reflective phototplethysmography as used in Easy Pulse board. we know that based on the changes of the blood volume, the output voltage from the sensor also changes (as u R-B said). Blood volume will be different for each and it will be also different for the individual at times, based on the function of heart. Yet, the amplification factor of the design is fixed (101*101 = 10201). we know that the micro controller is compatible with only in digital(TTL) signals (1 or 0) and normally 5V – “1” and 0V – “0”. we are using TMRO (timer) module (counter mode) so that we can count the pulses recieved at RA4 (TMRO). As we know we cannot convert the analogue into digital signal while using the TMRO (Pin4). Suppose when measuring the heart rate we come across a situation where the fixed amplification factor(101*101 = 10201) is not enough to drive the signal to 5V, since the signal from the sensor is weaker than expeceted. 1. Since the amplification factor is not enough to drive the voltage to 5V (logic 1), the micro controller will not function since the signal is analogue. we also cannot use A/D conversion here??? is that the reason why you are using 5k potentiometer at the end of amplification stage??? 15sec delay is created in the program using timer module (Delay 15000), so that when it is executed “Enable” also in high so the transmission takes place and the signal goes to RA4 pin(TMRO). I think that the timing delay and counting the pulse is functioning in same memory location, which will overwrite themselves and program will stop functioning. 1. Is it possible to use both delay and counting operation at same time?? ?At the same time TMR0 is used to count the pulse from the output of the signal conditioning as well as for delay. PLZ enlighten me on this issue…. then translate into Indonesian so my friends can make this project. You can translate a part of it or write a summary in Indonesian and link to the original URL for full description of the project. You can also share some pictures on Facebook too. Try replacing 150 Ohm resistor with 240 Ohm resistor and see if you get a better response. 1) The raw PPG you showed (~1.7V) is measured at pin 4 of the the sensor TCRT100? I always got ~ 0.2V. Is that normal? 2) Is it hard to get the signal from your finger? I tried to place my finger at different orientations from the sensor but it seems quite sensitive to the position. In fact, if placing finger to close give no signal at all. Have you experienced something similar? How to get meter pulse up to 220-230 ? What is maximum metering pulse for actual circuit ? Can I change MCP6004 with LM324 ? They looks the same both are 1MHz quad opamp with the same pins. thanks very much the circuit works fine. I do it myself again on a bread board with TCRT5000 sensor I couldn’t find TCRT1000 in my city. again thanks you very much for your circuit and sharing it for free. after that I change some values in the circuit because of heart rate frequency it works better after that. I changed HPF values to 1 uF cap. and 330 K-ohm for cut-off freq. .48 Hz and the LPF cap. value to 78 nF for cut-off freq. 3 Hz. I change values to tune up circuit for faster response and also wider bandwidth for heart rate freq. the min and max values of possible heart rate is 40 to 170. this values works fine now. Hi alireza , can you please share the final circuit for your improved bandwidth version . Can you tell when you have this kit for sell again? Raj! Can you help me with car voltage monitor circuit, i really want to do this for my mother? thank you so much! I post a question in car voltage monitor, i have two wire from car charger, white wire and red wire, how do i connect them on pic16f1827?? I won’t buy from China too long waiting too bad!!!! Raj? I requested the shipping cost to canada to send you the money, and you don’t answer… ?? Sorry, Easy Pulse kits are all sold out. More will be available in future through Tindie. I will post when. Is Vout is Vsensor pin? Vout is shown in the circuit diagram. Do you have a complete schematic for this version? The complete schematic is divided into three parts as shown in the article. The O/P from the first part goes into the second, and o/p from the second goes into third stage. I think the circuit diagrams are easy to follow. Let me know if you have any further questions. Thanks for the very well written article. I built a brass board version with your exactly specified components. Unfortunately, the LED pulses at 60 flashes per minute, even when the sensor is not attached. I have checked and re-checked the wiring but can’t find the problem. I will drive a stake through its heart and start over. I realize your article was written 5 years ago, so I don’t really expect a reply. What was stopping you from doing the filtering digitally? Hi. I plano to build this from scratch just for fun, but don’t know what the right VOLTAGE values of the capacitors are. Can you tell me what is the voltage value of the 1uF and 100 nF capacitors, please? Both 100nF and 4.7uF are 50V rated. 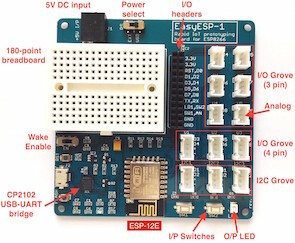 From this project : http://embedded-lab.com/blog/?p=1671, do RA3 is Enable and RA4 is VSensor? beautiful, never thought filters could result on a so well shaped curve of the real thing ! Hi, thank you very much to this sit witch is the best in micro controller field. could you pleas tell me what the right method to calculate the values of cut-off frequencies for the filters and why the ? ?or give me name of book about the filters and the practical application of it. One thing you MAY want to consider is to modulate the intensity of the LED light (say at 10-100 kHz) and then detect the signal synchronously (i.e., similarly to the way a lock-in amplifier works). That way you can move your entire signal to a higher frequency far away from typical noise that is more prevalent at low frequencies. Just a thought… Also, if you use 2 wavelengths, can you also make a pulse oximeter (http://en.wikipedia.org/wiki/Pulse_oximetry).